It is possible that you need to block certain websites on your computer, it can be any reason. Some websites contain virus stores, some have adult content complaints, and some try to steal your personal data. Even if you know all the tips to avoid such a website, but it is not necessary that the second person using your device keeps all the information about it. It would be better for such situations that you block some websites. If you want to control the access of a website to a machine on your computer, you can set up the block at the operating system level. This method of blocking the website is not very difficult and it will work on every browser. How to Block a Website in Windows 7The DNS system is considered as the backbone of the Internet. Its job is to translate any website address into an IP address. While you use a DNS server to browse any website, your computer has HOSTS files, which store these information on a local system. It can be used to block many websites. We investigated this process on Windows 7 and Windows 8. 1. Ensure that you have got access to your computer's administrator access. Sign in with the administrator account on your computer and then go to C: \ Windows \ System32 \ drivers \ etc \. 2. Double click on the file named "hosts", then select Notepad from the list of pograms to open the file. Then click OK. Now you will see this in the last two lines on Notepad ... "# 127.0.0.1 localhost" and "# :: 1 localhost". 2a If you are unable to edit the file, right-click the file named hosts and then select the property. Click on the Security tab, select the Administrator account, and then click Edit. 2b Once again, select the account in the pop-up, then check the full control. Click Apply> Yes. Now click OK in all pop-ups. 3. At the end of the file, type the address of the website that you want to block. To do this, add a line at the end of the file, in which first write 127.0.0.1, then the name of the website that you want to block. By doing so, the name of the site will be redirected to your computer. 4. To block Google as an example, type "127.0.0.1 www.google.com" at the end of the file (do not use the coat mark). You can block many websites in this way, but remember that you can just write the name of one website in every line. 6. Then close the hosts file and click save. Reboot your computer to make these changes effective. 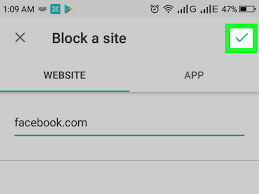 After doing this, you will find that all the websites you want are blocked. How To Block a Website on MACYou can block websites on OS X in this way. 2. Type sudo nano / etc / hosts, then press enter. If asked, give log in details. 3. This will open file / etc / hosts in the text editor. Type the name of the website in a new line, its format should be "127.0.0.1 www.blockedwebsite.com" (do not use quotes). For any website you want to block, write a line and then type the same command, just change the name of the website at the end. After writing the name, press ctrl + x then y, so that the file is saved. 4. After this, give commands, sudo dscacheutil -flushcache and then by pressing Enter or by restarting the machine, ensure that the websites have been blocked. Browser level blockBlocking a website on a browser is the easiest thing to do. To block a website on Firefox, you can install the addon named BlockSite. 1. Install the add-on, then press ctrl + shift + a, and then click on the extensions visible in the left. Now click on the option under BlockSite. Then click on the ad in the pop-up, then type the name of the website that you want to block. Repeat this process until you block all the websites you want. Finally, click OK.
2. Now all these websites will be blocked on Firefox. You can also give Password Protection to BlockSite. Doing so will not be able to tamper with the list of any blocked website without your permission. To turn on the password you must select the Option menu. Let you know that BlockSite addon is also available on Google Chrome. You can also easily block any website on Internet Explorer. Follow these instructions for him. 1. Open the browser, then go to Tools (alt + x). After that in Internet Options Now click on the Security tab and then click on the Restricted Sites icon in red. Then click on the Sites button below the icon. 2. Now in the pop-up, type the names of all the websites you want to block.